The other day, I was having my quiet time in the living room, when I looked out the window and saw a high-school kid run by. A couple seconds later another one came behind him. And then a few more. I realized that it must have been a spring practice for football and they were getting a morning run in. Then came a guy bringing up the back, most definitely the spot I would be in. I went back to my study and all of a sudden heard the sound of lots of feet on the pavement. I looked up and a group of about six or seven guys ran down the street, just a few seconds later they came running back up the hill together again. This time, the kid that was bringing up the back was in the middle of their circle. They were all running together, pushing and encouraging the guy. Pumping him up and cheering him on to finish the run. A perfect picture of community. As Christians, one of the most important things we have is community with one another. The Bible is full of examples of people living together in community. Some good, some bad. Some influential, some not so much. Throughout my college career, one of the things my college minister would always tell us is that living the Christian life is not something we can do alone. Living the Christian life is not an easy one. We are constantly called to go against the grain. We are called to be in the world, but not of the world. We are supposed to live above reproach, live a life that imitates Christ, and glorifies God. We are called to what seems like a giant task, and it is, but we aren't called to do it alone. Even Jesus didn't carry out the Father's business alone! He surrounded himself with the disciples. Although they weren't always the brightest of the bunch (just like us. ever notice how when Jesus told a story, he usually had to repeat it a couple of times? yeah, he has to do that with me a lot. ), they provided him with community. He may not have had a place to lay his head at night, but he did have friends nearby. Not only did he have the disciples, but he was constantly connected with the Father. As Christians, we are constantly connected with the Father as well. One of the greatest privileges we have is that of communication with the Lord, through prayer. We can approach the throne with confidence, that he will hear us, even when it seems that our prayers only reach the ceiling. But, if I'm being honest, in my human nature and with all my feelings, sometimes this isn't enough. And I think the Lord knows that, which is why he wants us to have community with fellow believers. When we come together with other believers, we not only are a great force for the advancement of the Gospel, but we are given people that can surround us to do life with. When we surround ourselves with other believers, we find people that understand what it means to walk the Christian life. We find people that are maybe in the same place as us or have been there before. Singles find other singles, married couples find other married couples, widows the widows, single parents other single parents. Even though we learn from people similar to us, we can learn from everyone else as well. The older people in the church can pass on their wisdom to us twenty-somethings and singles can learn from the married and vice versa. Everyone has a part in the body of Christ, without just one, we would crumble and fall. I admit there are times where I don't want to be around people (its the introvert in me). There are times I would much rather try and figure things out on my own and not let people in on my problems. There are times where I don't want to hear about other people's problems...or triumphs. But, it never fails, the more I seclude myself, the more I'm making myself be alone. And this alone is not nice like the other. This alone is empty of all encouragement. Yet, I have a God who loves me. And in the midst of being alone, I can hear him calling me back. Out of the darkness and back into the world. Back into community. A community of believers. Friends who truly care. Friends who understand the seasons that I'm in. Friends who encourage. Friends who love. Friends who point me back to the cornerstone of our community. Christ. We all need people who can come behind us and help us up the hill. We all need encouragement. We all need community. 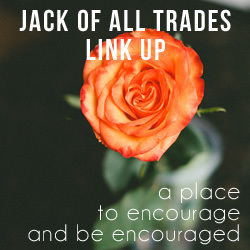 Linking up with Chantel and friends again for the Jack of All Trades Link-Up!